Happy Saturday! I wore the above outfit on Wednesday but I had originally thrown on the below outfit before I decided I needed to be more comfortable. 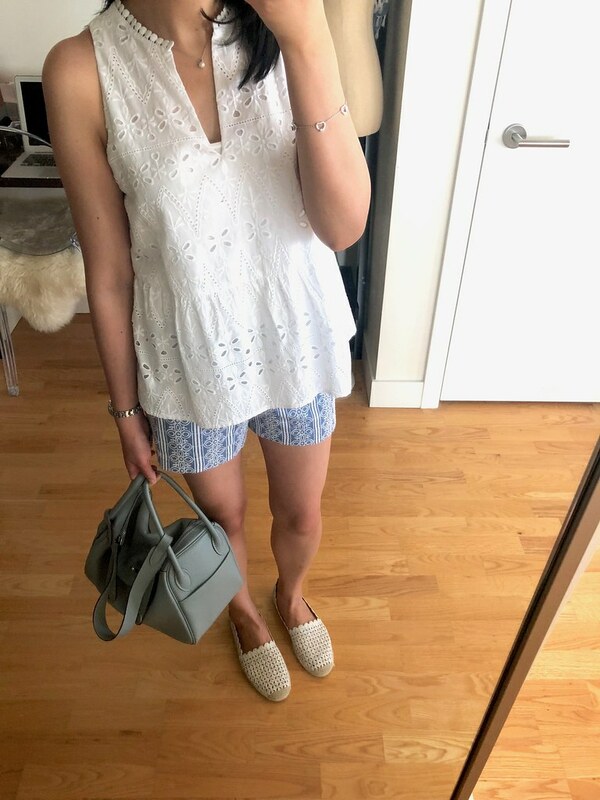 As much as I love this eyelet top the narrow arm holes due to sizing down to XXSP have been really bothering me the last two times I wore this top. I’m going to have to do one more purge of my closet since I feel like I have been aimlessly buying all in the search of closet favorites. 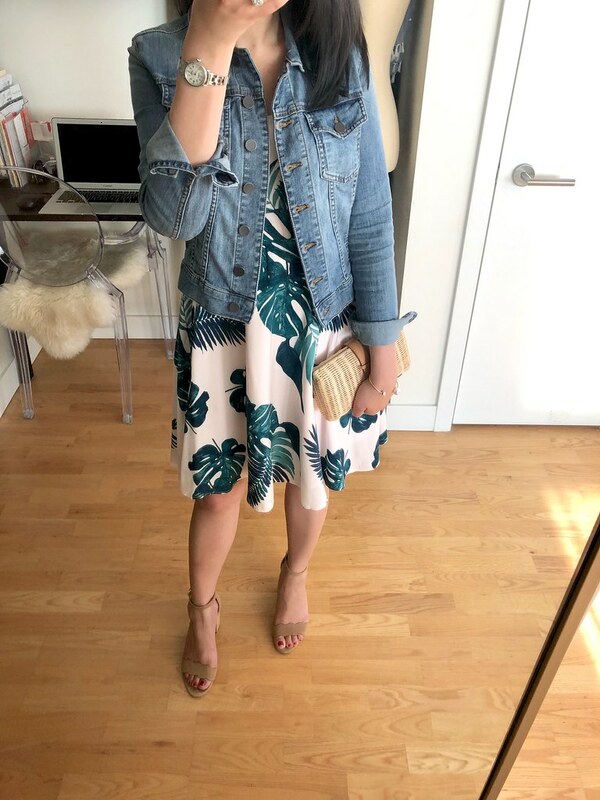 Speaking of closet favorites, I love this denim jacket with this palm print dress (now on sale for $15) which I regret not getting in other prints. 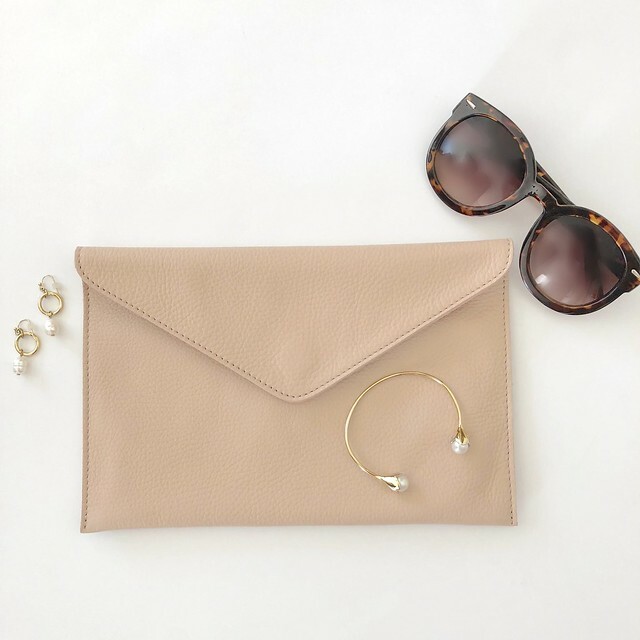 This simple leather envelope clutch measures 10″ in length and 6.5″ high. I was surprised to find out that it’s made in Switzerland and the Ann Taylor logo is tastefully stamped inside where you can’t see it. The 100% cowhide leather is very soft and the stitching looks good too. It’s a soft pink color that’s the perfect neutral. It has a magnetic closure and a tan khaki colored fabric lining. The edges are decently finished too. Despite the slim profile it fits my iPhone 8+, key chain, lip stick, card holder and sunglasses in a thin fabric pouch. I ordered it on the first Tuesday of the month when it was an extra 60% off sale so I only paid $34 for it after the extra 15% off cardmember discount. The clutch is soft so it has no structure to it and I am leaning towards returning it despite the awesome sale price. Upon closer inspection this clutch looks exactly like the one from LOFT which includes a crossbody strap. This collarless twill zip front jacket is back in black, tan and chambray this season (I’m also eyeing this pink Hinge tie sleeve jacket)! The olive color I have is from 2016. 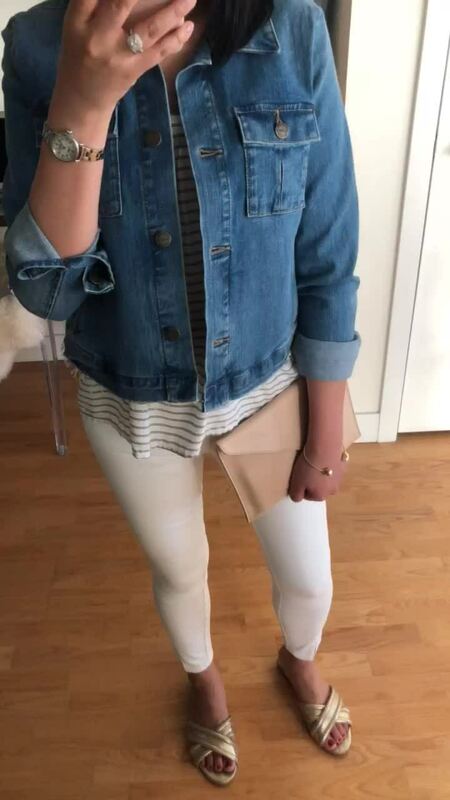 This short jacket is a favorite of mine and it has washed and held up well. 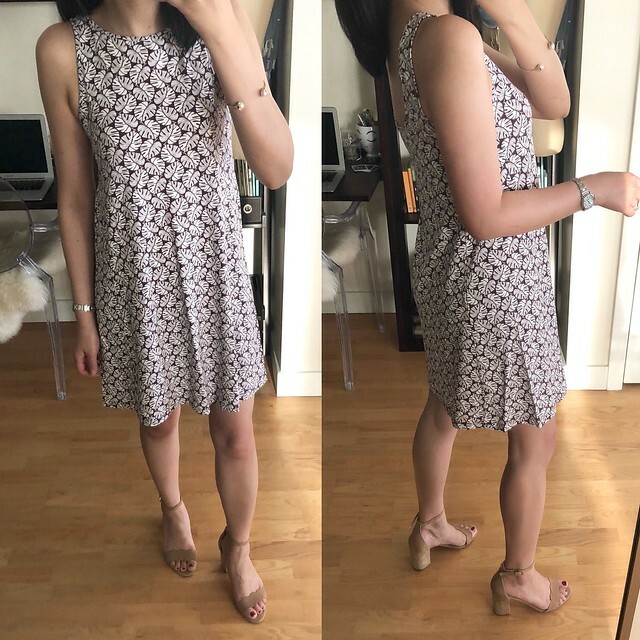 Anyway I am not sure I like the above look but I do love the palm print so I’ll have to see if there are other ways to style this dress aside from wearing it alone with some cute sandals. If you love stars a few other styles are available here. If you love this magnolia print it’s also available as a top. LOFT – Select tees and shorts are on promotion for 50% off. Since no code is needed on you can use code APR441LC to save an extra $25 off $75+ on full-price promotional items. Also save an extra 50% off sale styles. LOFT Outlet – Everything is on sale! 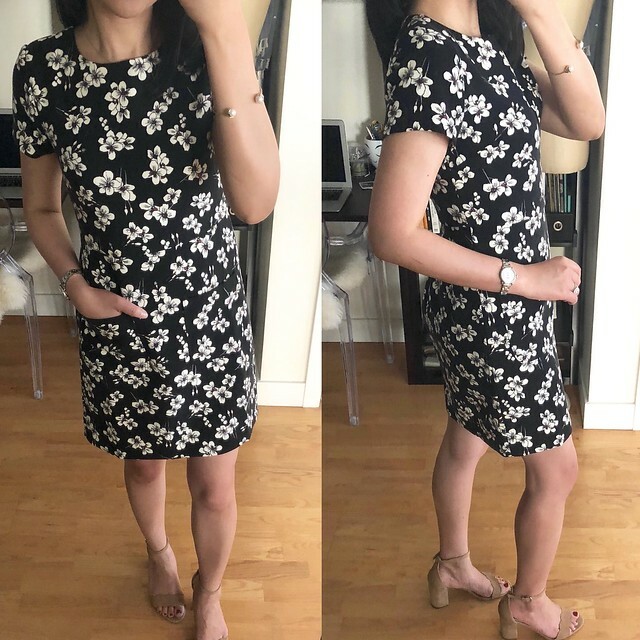 I love this floral wrap maxi dress and I’m so sad it’s not offered in petite sizing. 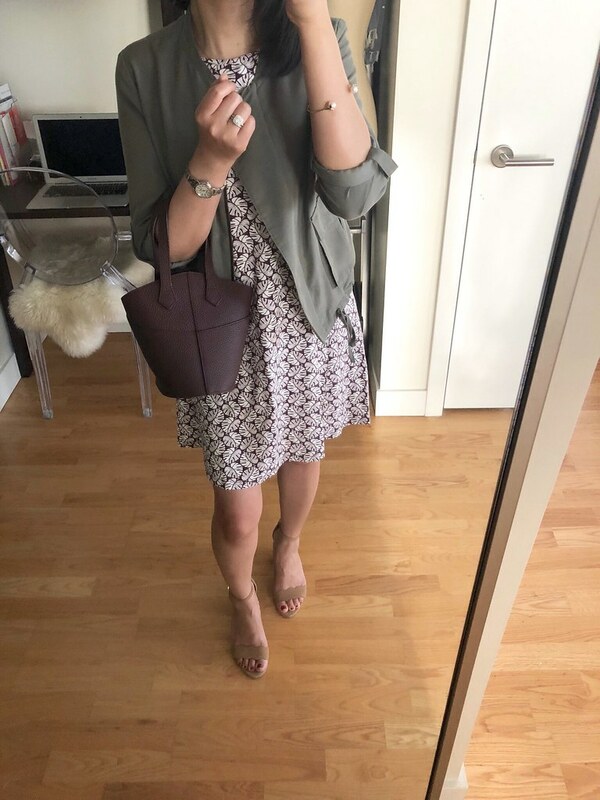 Also how cute is this floral ruffle wrap dress as seen on @loftoutlet3029? Ann Taylor – Get up to 40% off full-price styles and get an extra 50% off sale styles. Use code YOUPICK. 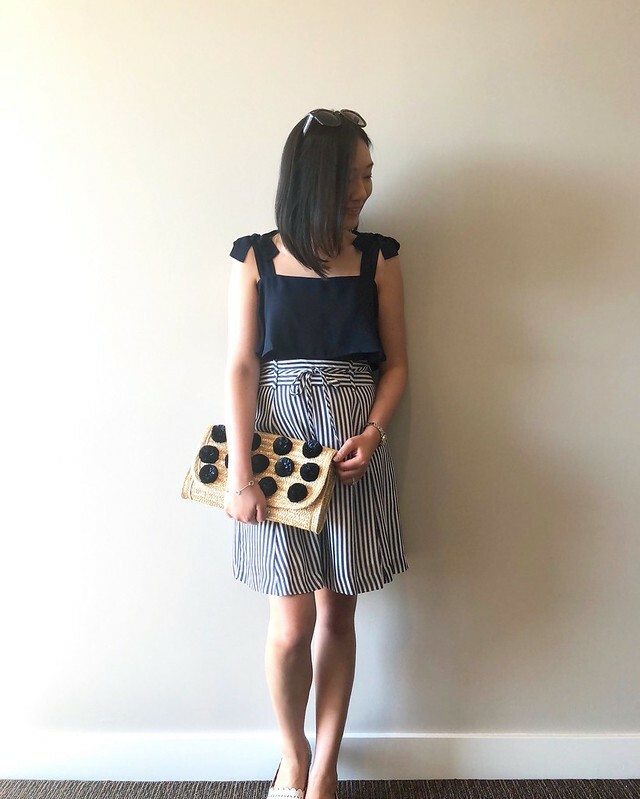 I spotted this adorable geo scalloped pintuck shell today and I wanted to order size XXS regular but it sold out so quickly! Size XS regular did fit me well so I’m tempted to order it. You can use the ShopRunner shipping option for free 2-day shipping (and returns) on minimum orders of $25+. If you sign up for ShopRunner via PayPal you can enjoy a free membership for two years. Note: ShopRunner is a complimentary service for AmEx and Mastercard holders! I recently updated my ShopRunner membership from PayPal over to Mastercard. Ann Taylor Factory – Get 40-60% off select full-price styles and dresses are $39.99 and up. DSW – If you’re a DSW VIP you can get 20% off everything. Use code YAYDAYS. Brand exclusions apply. Sale is valid through 7/10. I reorganized my purchases page the other day and I also updated this page of my blog so that you can easily find my reviews by retailer. It’s found under the ‘Shop’ tag of my blog at the very bottom of the list. I have a few more packages coming this weekend so I’ll try to share more soon! Update 7/8: I posted my first IGTV video today and there’s a new dedicated page for the NSale. I also took away Disqus and I have enabled comments via the native platform for my blog so hopefully it’s easier for you to leave comments or questions. So many pretty dresses! It’s a tie on my favorite, love both the sleeveless palm print and stars! Thank you Kristie! 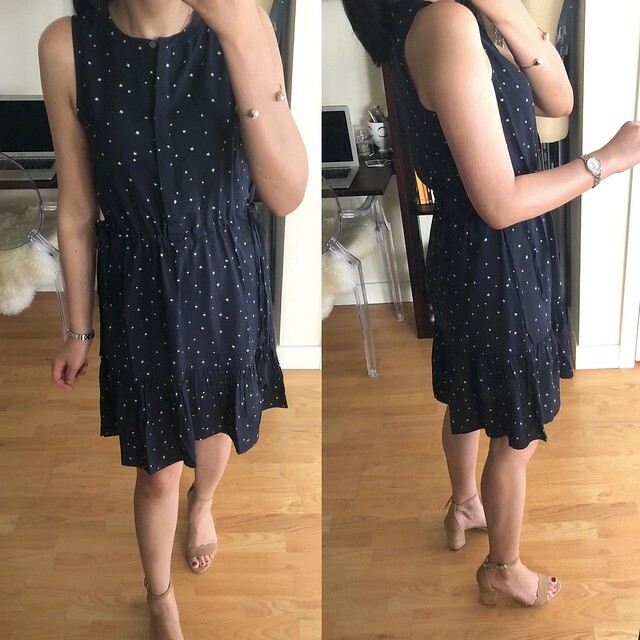 I wish the star print came in petites. Have a lovely weekend!